Poor writer's plagued Rachel Vater with the same dilemma! Forgive the insane rambling....but this is yet another example of what I believe to be proof of some sort of universal fate. I am always hearing of (and occasionally experiencing) the weird matter of two totally unconnected people writing the same book, drawing the same comic strip, coming up with an idea so similar to someone else's that it's eerie. Yes, folks, there is a master plan for the universe, and it's on a tight schedule. If you don't write that brilliant book--someone else will! If Shakespeare had remained in the glove factory, someone else would have written Hamlet (and the audience would have clapped with hands clothed in Shakespeare's Complete Works.) If JK Rowling had fallen off the train to Scotland, someone else would have written Harry Potter. If Trey Parker and Matt Stone had gone into the priesthood, someone else would have created South Park. I'm not sure if it's scary or reassuring, but I know it makes me want to get my book back in circulation--fast. grrrr--ask one agent at a time! Tell me what you drink and why I should give a damn. Hey. Where did I see this before? Some guy invents a horseless carriage, a wireless communication device, a beverage that will change the world. He (or she) races to the patent office to register the faaaaabulous discovery. What invention wins? The one that works, tastes, feels, makes you drool - better. Coke or Pepsi, anyone? Blame Canada. In at least one case (three if you count basketball and hockey) we came first. Make yours better, and you'll surge ahead. In science, when two people come up with the same idea at the same time, it usually just means that the discipline had progressed to the point where that new development was the next logical step. It isn't serendipity so much as great minds thinking alike. Of course, this doesn't explain how two similar pieces of art would jump into being at the same time. That is weird. I also had deja vu. And therefore, I'm going to repeat myself: This happened to my husband. Twice. I would freak out if it happened to me. I'd get over it, but it'd take a while. 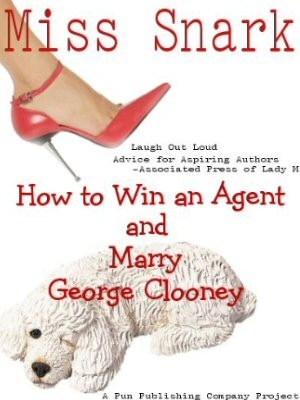 "grrrr--ask one agent at a time!" But exclusives are not in a writer's best interest. Until you read it, how do you know it's exactly the same book. There are a lot of books on the same premise. Look at Shakespeare. It's been redone a hundred times under different terms. I will have to hassle my friend with that one since she is from there. Canucks are everywhere. By the time you go through the process of submitting to an agent, agent submitting to a publisher, editing, and then publishing, that other book will probably be long forgotten. Well, I guess we know Miss Snark isn't Rachel Vater. The reason we're seeing so much duplication is because lots of people are reading and want to write,(which is good) but then they generally end up writing what they read (which is bad). So, challenge yourself, and instead of recycling, pull out the old imagination, start another book, and this time check the bookstore and your genre first. Maybe two years down the road take a look at your original work again and see if it has since been duplicated. If not, then retool. If we did read every book in our genre, that would certainly solve the problem, as we wouldn't have any time left to write. I think you are all missing the larger, more important issue here: Miss Snark thinks that Pittsburgher's would discriminate against Killer Yapp's choice of accoutrement. Au contraire, my dear Snark; we would welcome your pink tam wearing companion with open arms, though we would prefer if he would temporarily don a black and gold beret instead. This is nitpickery, but it absolutely drives me absolutely crazy when people use the word "Deja Vu" incorrectly. Deja Vu is the feeling you get when you are in a place that you have NEVER been in before, but feel like you have. It's not simply seeing or doing something twice. Like Meg said, read the book before you panic. I was just starting Book 2, and I was all delighted with my Brilliantly Original Idea, when I was flicking through books in a shop one day and discovered that another book with EXACTLY THE SAME PREMISE had just come out. From an author who writes in the same genre as I do, but who is a whole lot more famous than Newbie Me. I sulked for the afternoon. Then I went back, got the book, started reading it and quit panicking. Yes, we started from exactly the same premise - but the way she follows through on it is utterly different from the way I'm planning to. And we write completely differently. So I quit panicking and went back to writing. It's very possible that, although you both have the same basic premise, what this author has done with it has nothing in common with what you've done. Check before you even worry. "Except, of course, you live in Pittsburgh and she lives in Saskatoon, so she couldn't have possibly stolen it." A - The Bookian Mind Meld (which allows ideas for books and characters to circulate freely in the collective brain of the entire creative community) doesn't work across international borders. B - As a Saskatonian, or even as a Canadian, she would be far too nice to steal your title, plot and character's initials, even if you left them lying around unattended in a bus terminal. Whichever, it's good that you've exonerated her. Now, just change the title (the publisher will change it anyway) and your character's initials, and go for it. snarkaholic, I've heard that before. It's déjà vu all over again. Seriously, the term has entered general use as an ironic comment when you have, in fact, experienced something before...like saying "Hmm, this administration's activities seem very familiar. Oh yeah, I remember this! 1938 in Germany." If you're going to be pedantic, go all the way. As I've said elsewhere, when you're sufficiently pedantic everything makes sense. I've been tinkering with a novel for near 10 years with a pretty solid title in mind. THen last December, I saw that a book had already been published (2003) with that title! The concepts are completely different, so I just found a new title, which turned out to be stronger. Thanks Dawn Cooke! I wouldn't have changed my title without you. Merely adding my voice to the herd (heard? ), I would say keep plunging ahead with your shiny polished book. It's all about market value, as has been mentioned: if yours is better, people will read it. Look at a self-help section sometime and try to count the number of books with almost identical titles...and they all have the same information in them. Nobody can present something the way YOU can. 'Fraid 'twas me who sent the question. I just never thought in a zillion years the mighty Snark would actually answer it, becuse--as you can see by the question-- I'm desperately unlucky. Which is why I sent it to lovely Rachel's blog too. I'm posting big thank-you's on both, because I lurve you both, and I feel very, very dumb. I'm sorry. Please don't hurt me. Princess Sha'el said, "Odd song that. Do Canadians actually love each other?" I hate to burst any bubbles, but the answer is no. The French openly hate the English, the English secretly hate the French and the entire country despises Toronto. I'm a transplanted Torontonian anglo born in BC and now living in Quebec where I don't hate them and they don't hate me--we just get on with it like every other beleaguered taxed-to-the-gills citizen. Having said that, I agree with Inkwolf. I just had to jump in and say hey from Saskatoon. Yes, that's right, I'm a real live, honest to goodness, Saskatoonervillain. Uh, I don't think anyone actually sings The Maple Leaf Forever any more. Not even at Leafs games. Ironic, eh? I haven't heard it since grade seven (ca. 1962). I've lived in three vastly different parts of Canada, small and large cities as well, east/west, English/French areas and I've visited across the country except the Maritimes. All I can say is it doesn't matter where you live, you'll encounter the good, the bad, the ugly and the downright rude. Just like in the States. And for god's sake, we don't all say "eh"!!!!! Except maybe in Ontario? But honest to god, it was an American online friend who told me we supposedly always say "eh" here. I'd love to see a phonetic representation of that because I sure as heck can't think of what we say that sounds like "eh". This "eh" thing was news to me and I've always lived here. Seriously, the term has entered general use as an ironic comment when you have, in fact, experienced something before. If it entered general use in that way, it's because people don't know what it means. That's no excuse for misuse. Look it up in a dictionary. Exactly the same thing happened to me...except the bestselling author's agent rejected my full manuscript 3 months before author began writing novel (agent liked the plot but not the characters...hmmm). A little plot twist and voila, another best selling novel for author. And I was in the midst of a rewrite to end all rewrites. Read the book, cried, tried to move on with book 2, moped and now have gone back to reworking book 1. Hope springs eternal. Lesson learned: Procrastination should be one of the 7 Deadlies (oh, yeah...it is. It's called SLOTH). After something has been in general use for a while, the fact that it was incorrect to begin with becomes less and less important; then one day, you find it in the dictionary.